Hot Tub Filter for Accent Spas, Maax Spas (Canada), Apollo Spas, Aqua Mystic, Beachcomber, Blue Falls MFG LTD (Canada), Coast Mountain Spas (Canada), Coleman Spas, Custom Molded Spas, Dakota Spas, Emerald Spas, GPM Industries, Honey Tubs, Hot Spot Spas, Hot Springs Spas, Moonwater Spas, Nordic Hot Tubs, Orca Bay Spas, PDC Spas, Pentair Pool Products, Rainbow Plastics, QCA, Rec Warehouse, River Valley Spas, Rubadub Tub, Safari Spas, Signature Spas, Spa Manufacturers Inc, Streamline Spas, Sun Ray Spas (Canada), Thermo Spas, US Spas, Viking Spas, Waters Edge Spas, Waterway Plastics, Zone Spas, 17-2327, 100586, 33521, 25392, 303909, M-4326, 817-2500, R173429, Unicel C-4326, Filbur FC-2375, And Pleatco PRB25-IN. 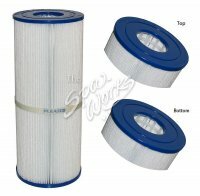 This Filter Was Also Used In Cal Spas, Alps Spas, Aries Spas, Blue Pacific, Esther Williams, Haughs, Heldor Spas, Hydro Pool Industries, JEM Spas, Rainbow Plastics, Sequoia Designs, Warm Springs Spa, And More. Also Designated Part Numbers: 17-2325, Unicel C-4625, Filbur FC-2370, PRB25-IN.